The mixed media art exhibit at the Cumberland County Museum and Archives on Church Street, Amherst, is now open and a couple of my quilts are included in that display. Ripley's Beelieve it or Not! As unbeelievable as this sounds...we landed another bee swarm! This one is twice as large as last weeks - enough for two supers of bees. And what super bees they are - settling in nicely and already busy at work. They arrived in what appeared to be a big, black cloud. Here they are forming what looks like a beard of bees on the front of the empty hive which was set out to lure them to land. There are a LOT of bees. all returned home from their day's work. This way no one gets left behind. Exciting stuff but...I am supposed to be quilting...right? Sometimes it feels like progress is made at the speed of snail but we've learned that slow and steady wins the race. Last evening some hand quilting details were added on the tall ships quilt, including the clapboards on the lighthouse. This week I purchased a new quilting hoop at Dayle's and I like it very much. These hoops, frames and stands are available in a variety of shapes and sizes and are hand-made by a fellow in the Moncton area. They are very good quality, and a terrific price. This is the 14" one but they come larger. It's so much more convenient to use than the big Grace frame. The Blue Jay outside the window is calling for rain. This makes for good quilting weather. I'm sure we are not the only family who revels in word play, but we certainly must be one of the most pun obsessed - all of us, old to young. Our language was butchered unmercilessly all weekend, with puns flying fast and furious, beginning with the ribbon around the new bee swarm and a note proclaiming "Happ-Bee Father's Day" to my DH. Those bees, by the way, were moved into place with the others returning from the blueberry field early yesterday morning (and believe me when I say "early"...) We moved the hives back to their regular home, and will have the fun of doing this all over again when the cranberry blossoms come into bloom in about two weeks' time. A pork BBQ was the highlight of the day and greatly enjoyed by all. DH greatly enjoyed his pork and bees...(groan) After the weekend nonsense of Father's Day, today was a bit of a dénouement... Since my big Grace frame is "occupied" with the silk log cabin quilt, the basting for the tall ships quilt needed to be done on the floor. I'd like to think this is good exercise, but...I dunno. It sure isn't a process I enjoy. However...it got done. 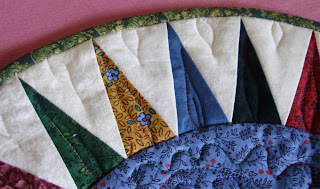 The first bits of quilting - with the walking foot - are complete, although you certainly cannot see the stitching here. I am pleased with the look achieved, as it captures what I was going for - a folkarty/storybook look. Tomorrow comes the free motion fun! "A Swarm In June Is Worth A Silver Spoon..."
There are many perennials in bloom in the garden and these German Bearded Iris are among the most impressive. The heads are massive and so exquisitely beautiful. They look as though they are stitched from velvet. Although it's hard to tell from the picture, there are six blooms and buds on this one stalk and we know from experience it will soon topple over unless some auxiliary support is added. One year they were so heavy, it took a hockey stick to hold them up! There are also many small Siberian Iris in bloom, this one a very vibrant yellow. I love the markings on the "tongue". Apparently it isn't just me who is attracted to these blooms. Yesterday my youngest son alerted us to the fact there was a cloud of bees in the backyard. Hubby had been cleaning out some old hives on the weekend - melting wax, etc. - and they attracted the attention of a passing swarm. They decided this was a great place to land and set up housekeeping, and we're very glad they did. We were quick to make the premises as inviting as possible in hopes our guests will make this their permanent home. It was a good many bees. They settled first on three frames, then we added more plus a feeder to fill the super. When a swarm lands, one can never be certain they will stay. These bees were quite content (relieved maybe?) to find a new palace for their beloved queen. When I checked back on them later, they were happily "bridging" the gap between frames. I could hear the hum of the hive on approach -a good sign. Early this morning, all was well with the swarm and they were out investigating their new surroundings. Naturally, they cannot stay here long as we live in town; they will join the other hives in the blueberry blossoms tomorrow. The old saying tells us: "A swarm in May is worth a load of hay. A swarm in June is worth a silver spoon. But a swarm in July, isn't worth a fly." We are happy with our new silver spoons. Two more sailboats, a Mariner's Compass and only a couple thousand more pinwheel blocks to go (well, it seems like it!) on this Tall Ships quilt. The border fabric is in the wash and it is very optimistic it will be included in this top before the weekend is over. There is never enough sewing time, which is my absolute favourite thing in the world to be doing. This week, time will be spent getting some pieces ready for an exhibit at the Cumberland County Museum and Archives, which runs from June 23rd into August. I had hoped to have this silk log cabin ready in time for this exhibit (remember this one from a few months back?) but as you can see, it hasn't progressed past the basting stage. How wonderful it would be to have opportunity to hand quilt this over the summer months. It is silk both front and back and will be haptic bliss to stitch. Since it isn't ready, I will choose another quilt from the stack to exhibit in its place, along with the Anne quilt which toured Japan. If you happen to be in any of these areas this summer, it would be great to have you stop by and say hello. The brochure for Nova Scotia Fibre Festival is now available, and the organizers have put together a fabulous lineup of activities. I understand the workshops are filling up already so if you are considering attending, don't wait to get your place reserved. Here are some pictures of Gail's scrappy Maritime Beauty from a spring workshop in Keswick Ridge, New Brunswick. Gail's use of a variegated thread worked very well with the many colours and prints in her centrepiece. It's really interesting to see how she has chosen to quilt her Maritime Beauty, and her application of binding by machine looks flawless. For me personally, I love the opportunity to stitch the binding to the back by hand. It gives a final few minutes to connect to the piece, hold it in my hand and enjoy the colours and design up close and personal - a treasured haptic moment. Terrific work Gail, and thanks for sharing. Eventually this picture will be added to the Sew and Tell page of my website. Many from the day in Keswick Ridge have emailed that they've finished their Beauties but Gail's pictures are the first proof. C'mon girls: we want to see them! The tall ships quilt took a backseat to other weekend activities. It's time soon to introduce some green to the mix - one more ship to piece before that, to be placed on the upper right hand side. I like blocks that build in tandem with each other, and you can see that the top sail on the ships is really part of the pinwheel block above it. A visit to the hives showed lots of activity, both inside and out. The blossoms on the blueberries are in abundance and the bees are happy and productive. There are seldom any stings when the bees are occupied like this; I'm not even sure they were aware of our presence - we were totally ignored. An adjacent hayfield was full of dandelions gone to seed. The fluffy white heads are beautiful...when they aren't in the lawn. It's been a juggling act of a week and progress has been painfully slow on the Tall Ships quilt. The colours are way off in this picture, but it's awfully hard to get good available light at 5 am. 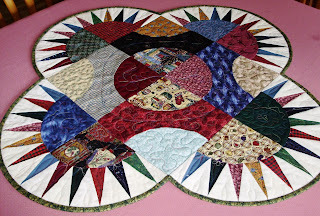 Last evening I worked late piecing several more pinwheel units, so those blocks should build quickly today. The colours for this quilt have been pulled from our N.S. tartan: blue, green, yellow, white and red. Today I had the pleasure of lunching with Bev Crouse of The Quilter's Net. Though she was only passing through town, we certainly made the most of our time together. Admittedly, we did not discuss sealing wax, but that gives us something for next time. 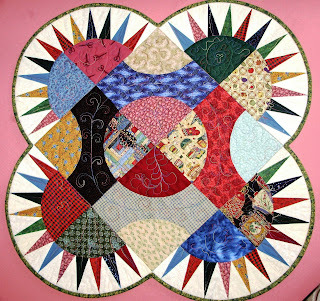 It's wonderful to hear how her vision of matching quilts to buyers over the internet is taking off. We shared experiences and suggestions freely and I came away enthused and inspired. Bev's slogan is "Every Quilt Deserves A Home" but certainly the opposite is also true: "Every Home Deserves A Quilt". Switching out the too-busy background of blues for a royal Kona Bay tonal worked wonders. I am much better pleased with the look. 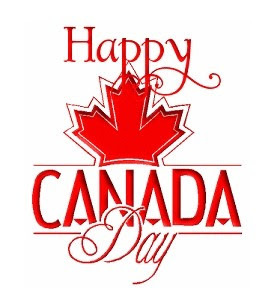 Doesn't it work well with our gorgeous Nova Scotia tartan?